How could I know why clients choose my product? When a client just bought your product. "Just" might be literally immediately after the purchase or in a reasonable time when client still might remember the purchase process. When a customer resigned from your product. That might be a direct cancellation or client just stopped using your product, didn't renew the contract and so on. Similarly to purchase - you should talk to your customer in a reasonable timeframe after the cancellation event, so a person has chances to remember the context around the decision. "Jobs-to-be-done" framework popularized the concept of "Switch" interviews. Thanks to this technique you can uncover real drivers behind clients motivations when it comes to choosing a solution to their problem. "Switch" interviews help to answer the ultimate "Why?" question regarding a customer choosing one solution over another. Switch to your product from another product. So, in essence, this is the same "switch away" interview just with a smile on your face rather than a grim. If the problem you're solving painful enough - it will always have a solution. Which means clients always switching from one solution to another. 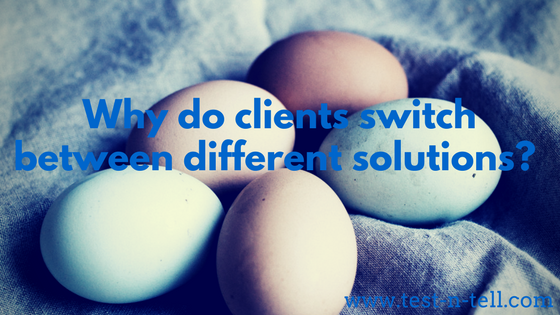 By conducting "Switch" interviews you'd know why and when clients switch solutions. What tool were you using before you bought <software>? Were you also involved in buying that? What was is it like working in <department> for <company> back then? Can you remember if anyone else was involved in the decision? What was their role in the company at that time? Tell me about the <old solution>. Can you remember how well that was working? Was it just your department using it? How do I recruit clients to interview? Those are your customers, right? They expressed their interest in your product very clearly by purchasing it. Even if your product is free - it still costs your clients time and attention. Those are quite evident indicators of value your customers are getting or expecting to get from your product. You most likely have a way to contact your clients. Do so. Ask them for a 30-45 min. interview. Up to you. With an incentive - you'll recruit interviewees faster. Without - also would do, just may take a bit more time. Types of incentive are plenty: discount on a product price, preferable support or plan upgrade. There are always classics such as gift certificates, free lunches or company merchandise. How do I know why clients abandoned my product? When they first had a thought your solution wasn’t working for them? When they thought there might be a better suiting solution? When and how they started to search for an alternative solution? How did they evaluated options and came to a switch decision? How did they use your solution vs. how they use a new solution? How do they like the current solution? When and how did you realize our solution does not work for you? What was your last use of our solution like? How did you search for an alternative solution? Why would a new solution be better for you? What solution have you chosen? How did you migrate to the new solution? This is a little bit more tricky. Those clients just turned their backs on you. For some reasons they no longer get value from using your product. Yet you still have a way to recruit them. The first place to explore is a cancellation page. Try to lure your former clients in the process of resigning from your product or immediately after. Wait long enough, and they might not remember who you are and why they left you. To find out why your clients abandoned your product you need to incentivise them. In this case, product-related incentives would probably not work. So go for standard incentives such as gift cards or other useful, applicable to a concrete person incentives. How many interviews should I conduct? 10 seems to be the magic number. 10 interviews are enough to spot clear trends or spot issues with interviewees selection and re-define the criteria. You obviously could do more interviews. But be sure to reflect deeper after each 10 interviews and evaluate if additional interviews would bring the value to cover the investment. As with other types of 1-on-1 interviews, you should aim for face-to-face meetings first. If those are impossible try audio-video conferencing. Your third option is a phone. If that's your first interviews on a topic, you need to do at least a couple face-to-face. Non-verbal information is far too important to be ignored! It's crucial to know why your clients chose your solution or a competitive one. This knowledge would help you to improve your overall marketing including product, positioning, price and promotion. "Switch to and away" interviews is a useful tool to get to the core of clients motivations. It helps you deeply understand the context of your customers. A better understanding of client's context and motivations is a sure path to a successful product.